Amstad Produce is Farmers Ending Hunger’s largest partner. In 2010 they contributed 600,000 pounds of potatoes, the single largest amount of food donated at that time. 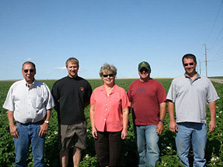 A family business, Amstad started growing potatoes in the northern Willamette Valley in 1959. Thirty years later the family operation expanded into Eastern Oregon where they grow and store the majority of their potatoes near Hermiston. 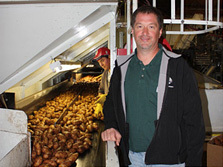 Jeff Urbach, General Manager at the potato sorting line in Sherwood. Tony Amstad offered his potatoes to Farmers Ending Hunger President, Fred Ziari, in 2007, at an event held in Hermiston to raise awareness for the program. Amstad has donated faithfully and generously since. Farmers Ending Hunger especially appreciates their donation because potatoes need no additional processing and can be sent directly to the Oregon Food Bank.